Connected Learning meet-up, #Philly style! Last Thursday, April 4th, we had what I hope is the first of an ongoing series of Connected Learning meet-ups here in Philadelphia. Organized by a few of us who are interested in this work — Meenoo Rami, Christopher Rogers and myself — I was thrilled with the diversity of folks from different sectors of the city/region who either came or expressed interest in being engaged in future conversations. The group includes educators and artists who work both in and out of school, program directors from both big and small institutions and non-profits in the area, professors at a range of local Universities, and folks working with youth in GED programs, with mentors in industry, who are in roles as mentors themselves. Along with those already connected through the MacArthur DML Initiative like the National Writing Project (including the local site PhilWP) the Learning Lab at the Free Library, and the Youth Media Collaborative, we had a good conversation with a healthy mix of ideas and questions as well as good energy for taking next steps forward. Our agenda for this first hour and half meet-up was simple — after a very brief (3 min) introduction to the Connected Learning design and learning principles, we asked everyone to spend a little time looking at the Connected Learning infographic and then share at small tables what they a) notice and b) what ideas and question are raised. We then shared highlights from those table conversations and had a whole group discussion. 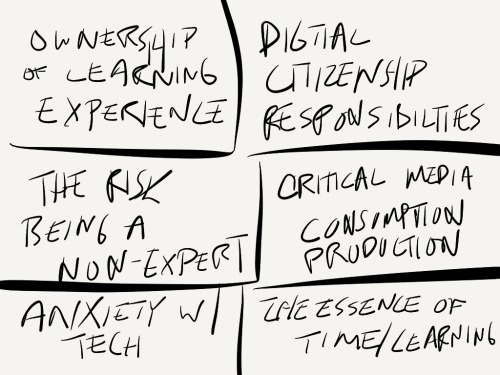 As someone who has been thinking about Connected Learning for a while now, a few ideas/questions stuck with me that I’d like to follow-up around, ie. First, a long-time friend and colleague attended is currently working with young adults in GED programs and her questions and thoughts about Connected learning made me think about this age group again and wonder what people and/or network resources might be available around Connected Learning at this point. The second notion is that there are a group of folks who are actively working to connect young people with folks in business and industry. And this work includes supporting those folks in industry to really know how to both connect as mentors as well as to build authentic opportunities for youth who might be involved as interns or apprentices. This kind of focus on cross-sector, cross-generational, with an emphasis on two-way authenticity, I know is key in a Connected Learning framework and I was actively wondering about connections here too. Would love to hear from others in response to these items … as well as invite anyone else who came to the meet-up to raise ideas/questions that have stuck with them. Run a curricular “hack-jam” where we get to bring projects, frameworks, curriculum, proposals, etc. that we are working on and “hack” them using the connected learning design and learning principles. Want to join us? If so, send me your contact information at ccantrill at nwp.org so that we can get you into the loop. Looking forward to more connected learning #Philly-style!